Would you like to know more about your figure type? 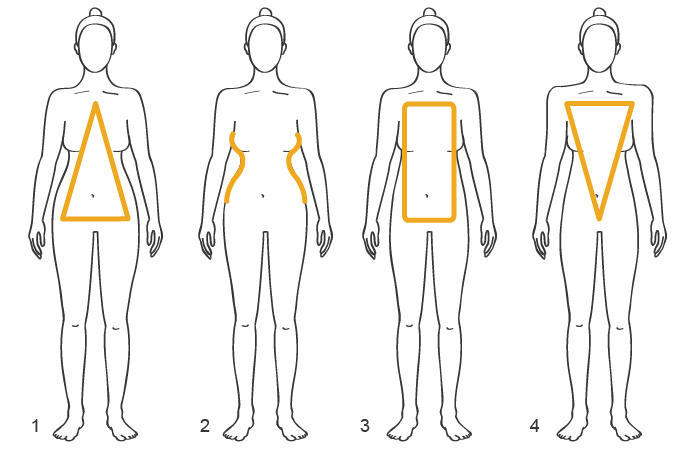 Thanks to our Figure Type Guide for women you’ll find out exactly which one of the four body types you are. It also includes some handy style suggestions to highlight your best sides and conceal any problem areas. With an A-figure, your upper body is more delicate and narrower than your hips and your waist is usually slim and pronounced. Your legs and buttocks tend to stand out from your figure and you have a clearly feminine shape. Go for garments that accentuate your upper body. Short tailored blazers and voluminous tops are perfect for you while wide dresses will soften the pronounced hip region if desired. With an X-figure, you’ll have shoulders and hips that are roughly the same width while your waist is usually slim and strong. Key features of the X-figure include pronounced chests and thighs, making your physique more powerful and sporty. Go for garments that accentuate your narrow waist. In addition to dresses, high-cut trousers and fitted tops are also ideal. If you want to conceal your thighs, you can’t go wrong with a T-shirt or shift dress made from flowing fabrics. With an H-Figure, your shoulders and hips will be about the same width. Your waist will be relatively straight, with no aspect of your figure sticking out. Your arms and legs tend to be long and slender and your physique has a generally sporty, androgynous look. Try to go for garments that give your silhouette extra shape. These could include fitted dresses, tops with a waterfall-style collar and high-waisted trousers. If you have a V-shaped figure you will usually have a strong upper body and a broad neck region. Your waist and hip areas are less pronounced, while your arms and legs will have a sporty, slim look. Go for garments that give your hips more shape and emphasise your slender legs. Straight tops with a low neckline will bring out your cleavage perfectly.